Why have Shakespeare’s plays been performed and filmed so often all over the world? This course will discuss adaptations and appropriations of Shakespearean plays in film and in the theatre. To “appropriate” is to make something your own, and that process tells us as much about the work of art being appropriated as it does about who does the appropriations. 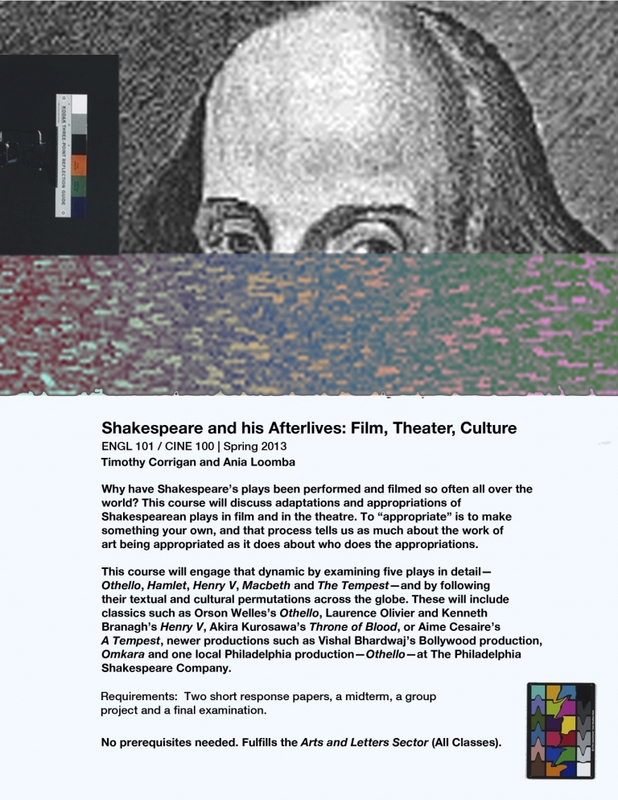 This course will engage that dynamic by examining five plays in detail --- Othello, Hamlet, Henry V, Macbeth and The Tempest -- and by following their textual and cultural permutations across the globe. These will include Orson Welles’s Othello, Laurence Olivier’s Henry V, Akira Kurosawa’s Throne of Blood, Vishal Bhardwaj’s Omkara and Aime Cesaire’s A Tempest. We will also engage with the production of Othello at the Philadelphia Shakespeare Theater. Our goal here is not only to open up these plays in all their textual complexity but also to think through the practices of adaptation especially as those practices have permeated and defined the literature, art, and cultures of the last one hundred years. Some of the larger questions shaping the course will be: What textual and technological pressures does cinematic adaptation involve? How have the practices of adaptation change through history? What do different cross-cultural adaptations reveal about specific societies and their values? Why and how has Shakespeare’s work remained such a dominant transnational and historical presence for so many centuries? When does Shakespeare stop being Shakespeare and become something new? Within this framework, students will have the opportunity to look carefully at a selection of major plays from numerous critical angles and, at the same time, to consider the problematic of adaptation in all their practical and theoretical richness. Requirements: regular attendance and reading, participation in class discussions, a short paper, a midterm, and a final. You will be required to watch selected films, all of which will be on reserve at Rosengarten. You will also have to watch local plays if we work with them. No prerequisites needed. All are welcome.